The Jesse Tree gets its name from the verses in Isaiah 11: 1. The Jesse Tree is a FUN way to explain the story of Jesus’ genealogy and the history of God’s plan of salvation. It starts with creation to the birth of Jesus, concentrating on the imperative points in Scripture such as the fall of Adam and Eve, the flood, and the lineage from Jesse to Jesus. Each day during Advent there is an ornament that goes along with a specific scripture. There is no right or wrong way to do a Jesse Tree. There are so many different ideas out there, so do what works best for your family. Please don’t worry if you skip a day. This is not supposed to be stressful, but enlightening for you and your children. Have FUN and marvel in HIStory. Since the number of days in Advent vary each year, there are a total of 29 scripture readings and ornaments. You might want to skip a few days or throw a few extra readings on Sundays. The option is yours. I print all the ornaments and cut them out. I place all of them in a basket. We rotate each day who reads the scheduled scripture for the day. One child finds the correct ornament that goes along with the scripture and places it on our little Jesse Tree. We discuss how the concept applies to our lives today and we say a prayer. A big list of Advent coloring books and resources that will help keep the spirit of Christmas glowing in your home. Check out the FREE Nativity stick figures that you can make to teach children the birth of Jesus. More Jesse Tree ideas that will enhance this Jesse Tree devotional. I created the Jesse Tree Devotional and Jesse Tree Ornament Printable Templates exclusively for my email subscribers. Please fill out the form below and you will instantly receive the Jesse Tree Devotion via email and be added to our weekly newsletter. We create weekly freebies for our email subscribers, so you always have something to look forward to. So now you know what a Jesse Tree entails. Feel free to ask me any questions. We have been doing the Jesse Tree for years in our home. Thank you so much for this! I am so excited to use it! This sounds amazing, love the idea and I am going to try to get this out to my grandkids. At the bottom of the email of the Jesse tree it says Jesse tree devotional and ornament templates in blue. Click on it and it should come to save or open. Hope this helps. God bless! The link is in the email. I am sorry you are having problems. What is your email that you subscribed with? Please email the link for the Jesse Tree printables. I think I am already a subscriber. Please subscribe me to your newsletter. 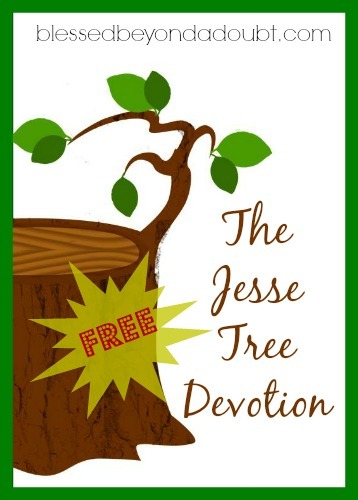 I would love the link to the Jesse Tree devotions. Thank You. Thank you so much for this ebook! I appreciate it very much and I am sure my children will too! This is a great idea! What do you use for a tree? How big is it? Can you post a picture of what your tree looks like? Thank you so much! Thank you! I’ve been looking for something like this! I really appreciate it and the time you put into making it for us! Please email subscribe me and send the Jesse Tree printables. I am wanting my Sunday School class to make their own ornaments. Thank you. Thank You so much for sending it to my email. It worked great:) It is awesome!! I would love to print the Jesse Tree materials, but I can’t seem to get them to come up to print… I see the devotional in the box and can get it to full screen, but neither right click nor ctrl-p allow me to print. I get sent to this page when I click the blue template link in my email from the 29th. Thank you so much for sharing your files, they are always appreciated. I was printing the jesse tree and my printer messed up. I got all but one page. I checked my email but don’t have on from you since I subscribed. Can you send me the link? I’m a subscriber but I never get the email to download the Jesse Tree. Sorry, I have a new system in place. You have to fill out the form for each freebie and it will be emailed instantly to you. Thanks for understanding. I’ve filled out the form for the Jesse tree but the email never shows up. What am I doing wrong? I just tried it and it works for me. Please try again and check your spam folder. Is the Jesse Tree download still available? Thank you so much! Please just fill out the form and you will receive the download via email. HTH! Great Idea, I was just wondering if i could have a copy. Gosh I know it’s August but I can’t wait to do this project!!!! I just subscribed but, I have no e-mail. Is this something that people can still partake in? What email are you using to subscribe? I will check my system.